Volvo Trucks Malaysia recently hosted a vehicle handover ceremony for its long-time customer – Kotamas Oil Sdn Bhd. 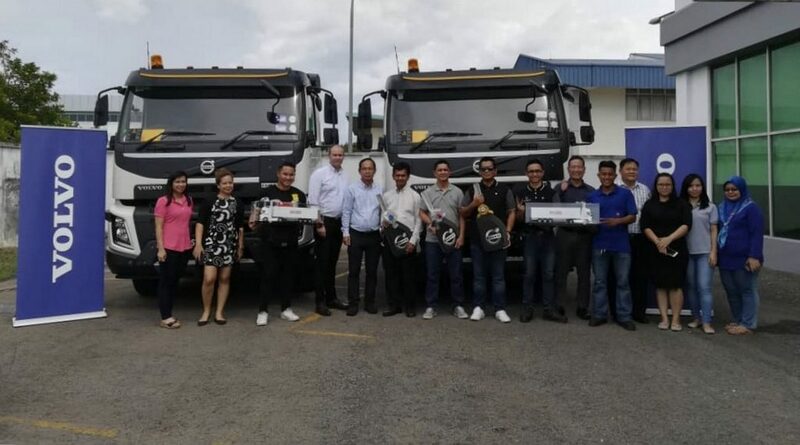 The official handover of 15 units of Volvo FMX 440 6×4 prime movers was held at Volvo Truck’s private dealer, Dai Lieng Machinery Sdn Bhd in Kota Kinabalu, Sabah. The ceremony was attended by the senior management team members of Dai Lieng, Kotamas as well as the Managing Director of Volvo Trucks Malaysia. Kotamas is a specialist in petroleum haulage in Sabah, servicing clientele such as Petronas and Shell. A strong business partner of Volvo Trucks in East Malaysia, Kotamas already owns and operates 12 Volvo trucks in their business. Kotamas now owns a total of 27 Volvo trucks. Rusman Bin Japalus, Managing Director of Kotamas Oil Sdn Bhd said, “As one of the largest fleet operator in the state of Sabah, we needed trucks that are capable of withstanding the rough conditions that our drivers work in, both in terms of terrain which is hilly and bumpy as well as unpredictable wet weather. We needed trucks that were not just dependable, but also safe for our drivers given the working conditions. Volvo Trucks is the company that provide trucks which are able to fulfill all the safety requirements outlined by the reputable oil and gas companies we work with. So having partnered with Volvo since 2014, we are confident that once again, they will be able to provide us with the solutions we need. 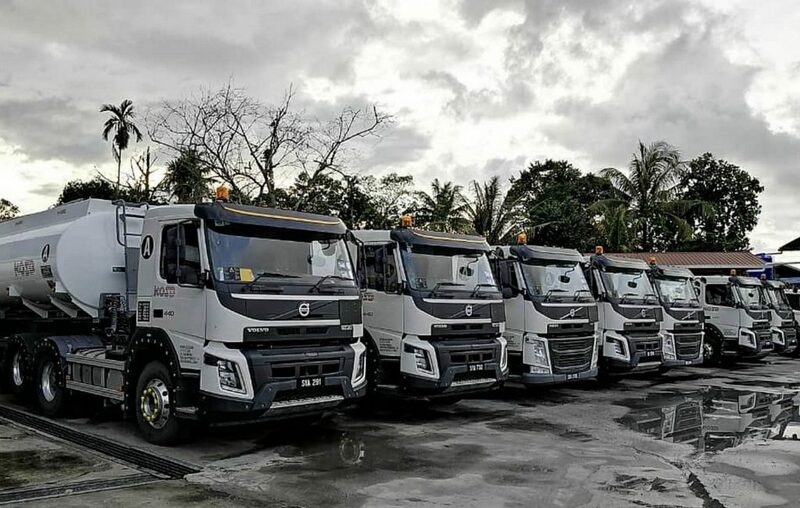 15 Volvo FMX440 6×4 prime movers lined up and ready for the handover to Kotamas Oil Sdn Bhd. This handover marks the first time that a company is receiving the custom made FMX 440 with Tandem Axle Lift in Malaysia. Volvo Trucks is also the only commercial vehicles manufacturer to offer this variant for prime movers in the country. One of the challenges faced by Kotamas was the hilly and rough terrain their trucks needed to go through, which demanded increased traction from the vehicle and often resulted in additional costs spent on tyres. After reviewing Kotamas needs, Volvo Trucks Malaysia recommended these tailor-made prime movers that leverages on Volvo’s Tandem Axle Lift technology. Tandem Axle Lift is designed for operations where the driver drives heavily loaded in one direction and empty in the other. With the push of a button on the dashboard, the driver can disengage and raise the drive axle to improve fuel efficiency by up to 4% on average. As soon as the truck is loaded, the drive axle automatically lowers and engages to ensure maximum traction and driveability. This system allows for extra grip on hilly terrains, providing better traction, tighter turning circles and improves overall fuel efficiency. It also reduces the money spent on replacing tyres worn out by travelling on rough terrain, thereby maximising the uptime of the truck and at the same time, reducing overall operational costs. “The technology that goes into the Tandem Axle Lift is truly remarkable and is a perfect fit for customers that need a prime mover which regularly travels on rough terrain. This is especially true for customers based in East Malaysia where roads are riddled with pot holes and sometimes not tarred, uneven and hilly,” said Peden. L to R (starting from the fourth from the left): Mitch Peden, Managing Director of Volvo Trucks Malaysia, John Ting, Deputy Managing Director of Dai Lieng Machinery Sdn Bhd, Rusman Bin Japalus, Managing Director of Kotamas Oil Sdn Bhd and Bahar Bin Rustan, Operation and Finance Director of Kotamas Oil Sdn Bhd at the handover ceremony at Volvo Truck’s private dealer, Dai Lieng Machinery Sdn Bhd in Kota Kinabalu, Sabah. It is Volvo Trucks’ mission to provide quality, both in terms of products and service. With that in mind, Volvo hopes to continue fostering the close relationship they have with Kotamas in the future, by providing innovative solutions and support to maximise the uptime of their trucks and ensure productivity. Malaysians Sweep Top Driver Awards At Inaugural “Scania Driver Competitions” Southeast Asia 2016-2017!